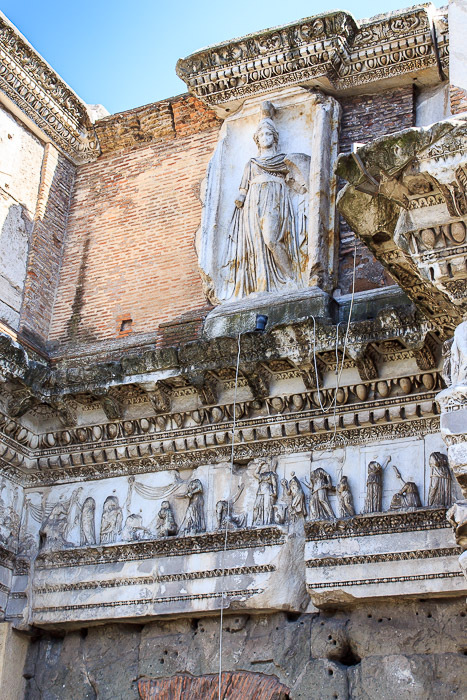 The Forum of Nerva was the fourth of the five Imperial Fora to be built. 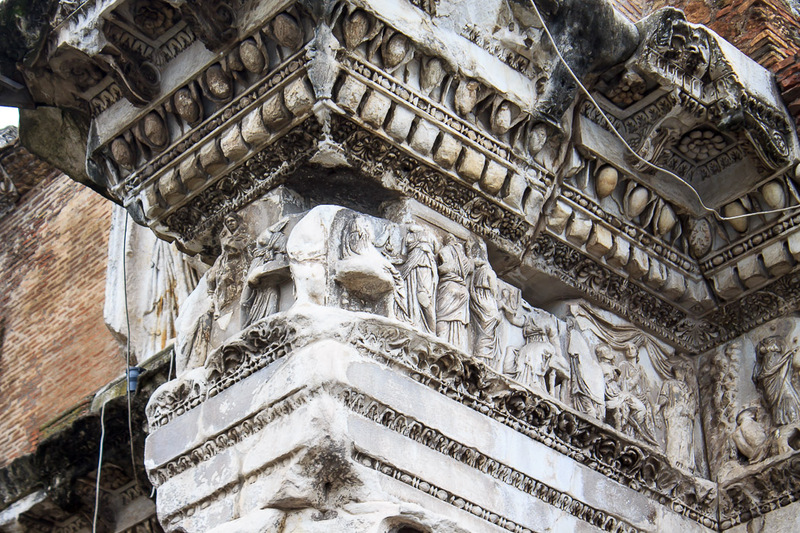 The most interesting part of the forum is located at the north corner of the intersection of Via dei Fori Imperiali and Via Cavour where a beautiful pair of fluted columns supports a richly-detailed entabulature and attic (1st photo below). 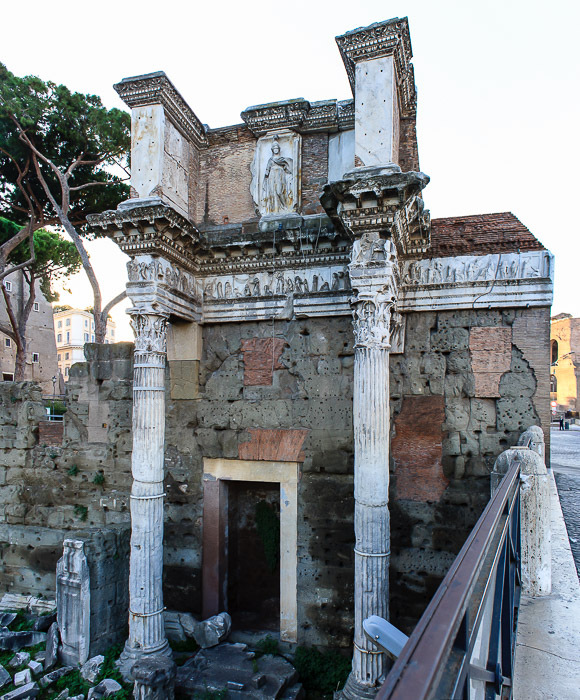 It's best viewed from either a few feet toward the Forum of Augustus along Via dei Fori Imperali, or from behind the Forum of Nerva, on Via Tor De Conti. 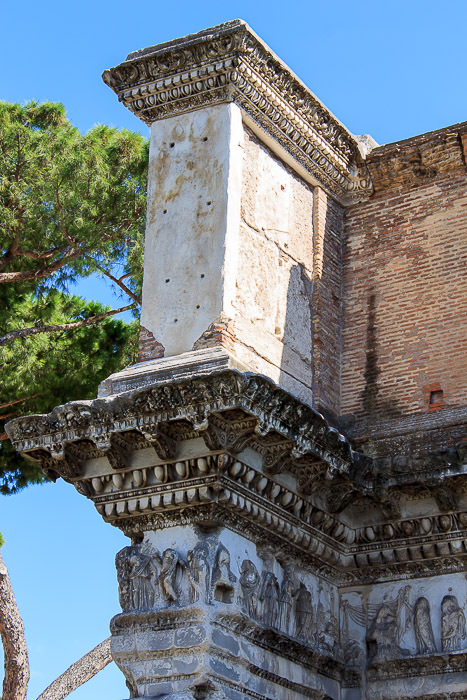 This structure, which has always been visible, is nicknamed Le Colonnacce (those ugly columns), but I think they're quite beautiful and that the frieze and attic above them are among the best remaining sights in the five Imperial Fora. At night, Le Colonnacce is beautifully lit up, as shown in the 2nd photo below. Since my home in Rome is a block up Via Cavour from Le Colonnacce, when I go out during the evening to walk around and take photos of the Roman Forum or the Campus Martius, Le Colonnacce is the last ancient site I see before returning home for the night, so it holds a special sentimental place in my memory of Rome. 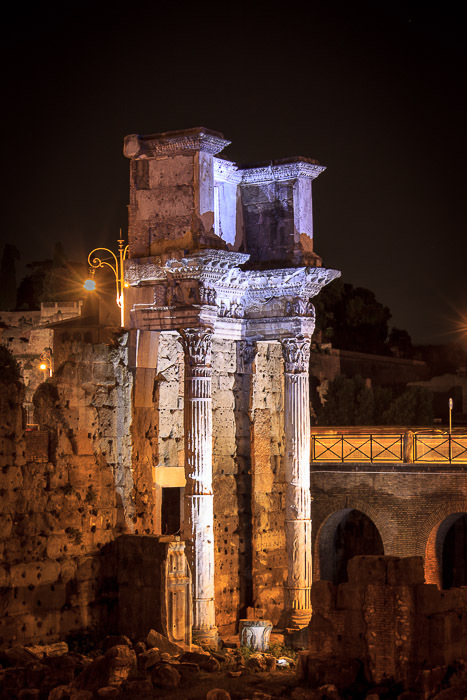 During my first trip to Rome I knew nothing of Le Colonnacce, but knew there were these pretty, lit-up columns at the corner of Via dei Fori Imperiali and Via Cavour which I saw as the last thing every night, so took the 3rd photo below of those columns, whatever the heck they were. In the morning, those same columns look like the 4th photo below, from street level. As you can see, much of the Forum of Nerva is well below today's street level (just like nearly every ancient artifact in Rome). Just a little to the left of Le Colonnacce along Via dei Fori Imperiali is the statue of Nerva, after whom this Forum was named. See all Forum of Nerva photos. 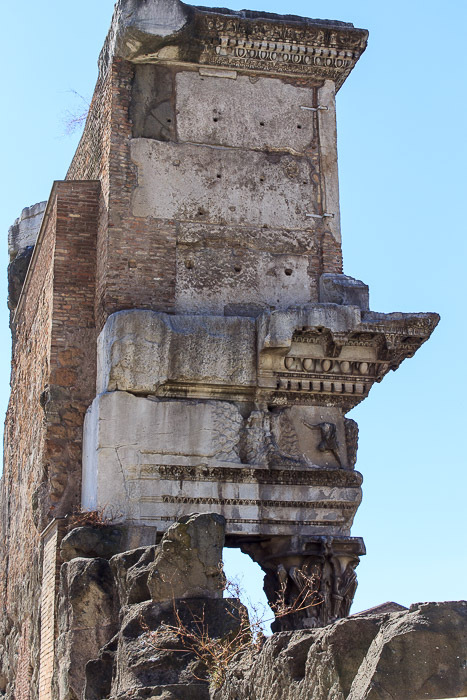 Le Colonnacce, a small piece of the boundary wall of the Forum of Nerva. 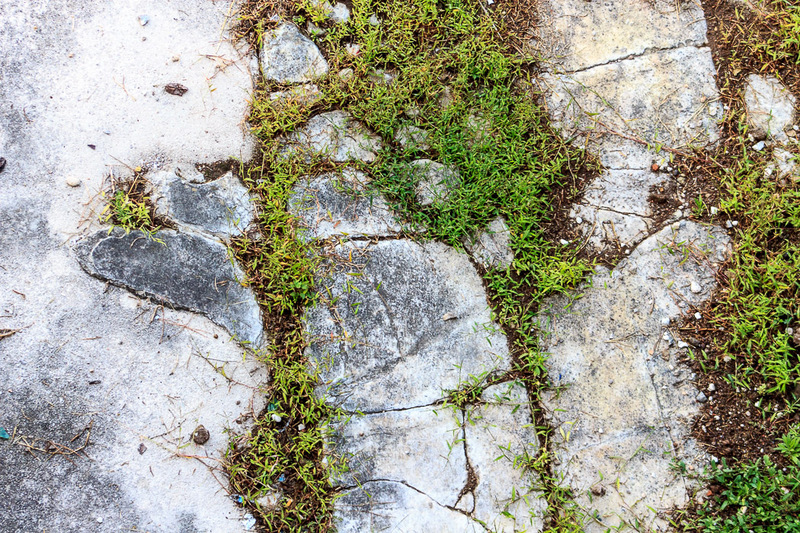 This photo shows just how far ground level has risen since ancient times. The frieze above the columns (1st photo below) shows scenes of women engaged in spinning, weaving, childbirth, and other pursuits (details in 2nd-7th photos below, arranged from left to right). 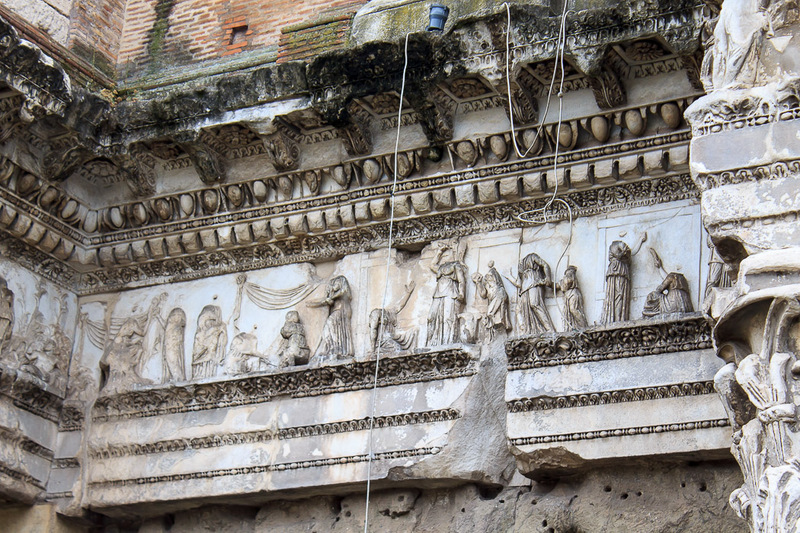 On the attic above the frieze is a sculptured panel (1st and 2nd photos below) showing a helmeted female carrying a shield, which has recently been recognized as being the personification of the Piroustae, a people of the Danube who were part of Domitian's triumph in Dacia in 89 AD. After walking up a very short block along Via Cavour, passing Torre dei Conti and turning left onto Via Tor de Conti, you can get the view of Le Colonnacce in the 3rd and 4th photos below. 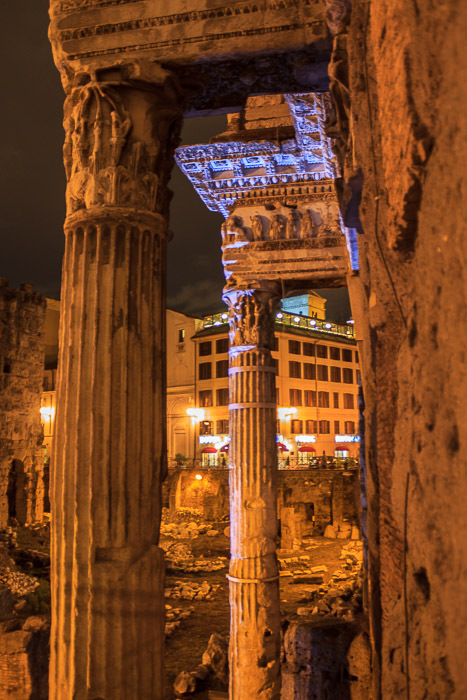 A wider view of the Forum of Nerva from Via Tor de Conti is shown in the 5th photo below, and using your imagination with this photo you should realize that this pair of columns, Le Colonnacce. 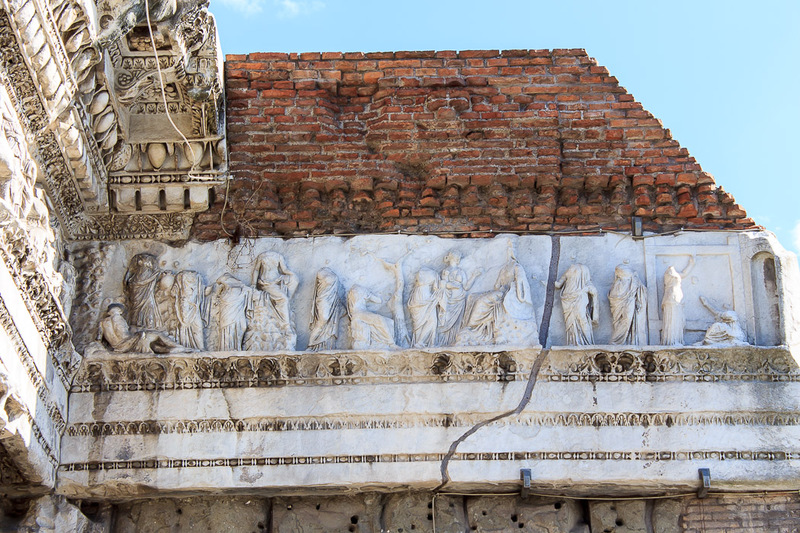 is just one small segment of the outer wall of the Forum of Nerva. 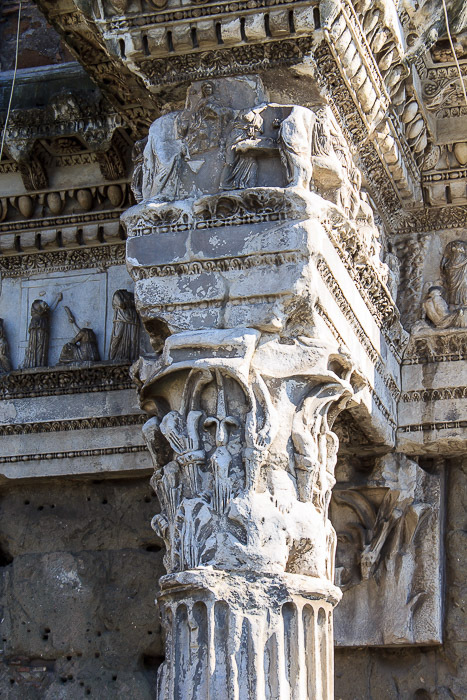 Just beyond the left edge of today's Le Colonnacce was once another sculptured panel with a different symbol of some conquered people, then another column, and so forth, streching to the back of the excavated area, which was the back edge of the Forum of Nerva, where you're standing now. 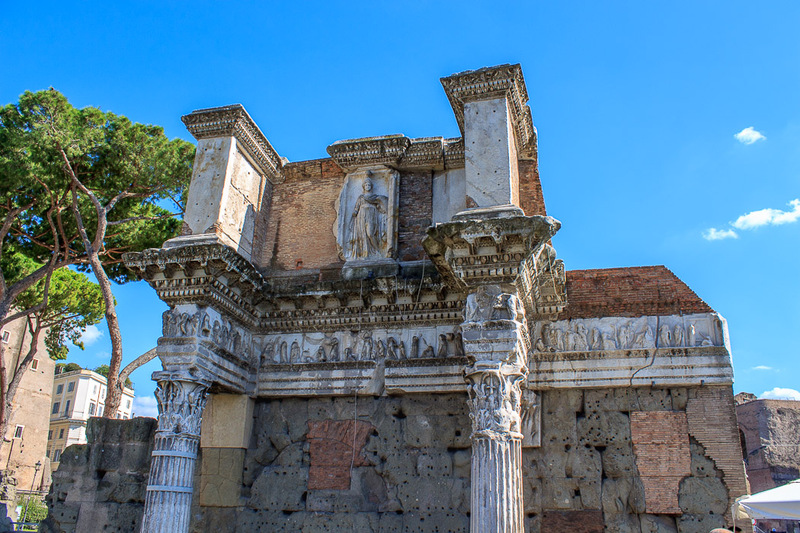 A second, parallel wall of columns faced this wall of columns right about where the triangle between Via dei Fori Imperiali and Via Alessandrina begins (the rounded exedra wall of the Forum of Augustus cut in to the Forum of Nerva at this end). 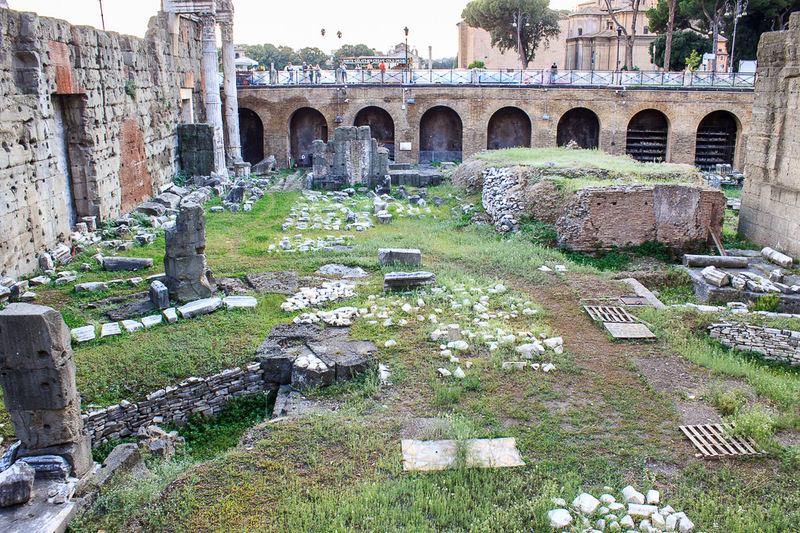 The Forum of Nerva was quite long and narrow, stretching off to the far side of Via dei Fori Imperiali, and two more times that distance. It was bounded by these two parallel walls of columns, friezes and attic, with paving between the two walls. It served as a corridor between the Forum of Augustus (on your right, on this side of Via dei Fori Imperiali), the Temple of Peace and Caesar's Forum (both on the far side of Via dei Fori Imperiali, to the left and right of the Forum of Nerva, respectively), and because it connected those three Imperial Fora it became known as the Forum Transitorium. Alexander Severus set up colossal statues of all the emperors who had been deified in the Forum of Nerva, but they're long gone. The underground Cloaca Maxima ran the length of the forum. 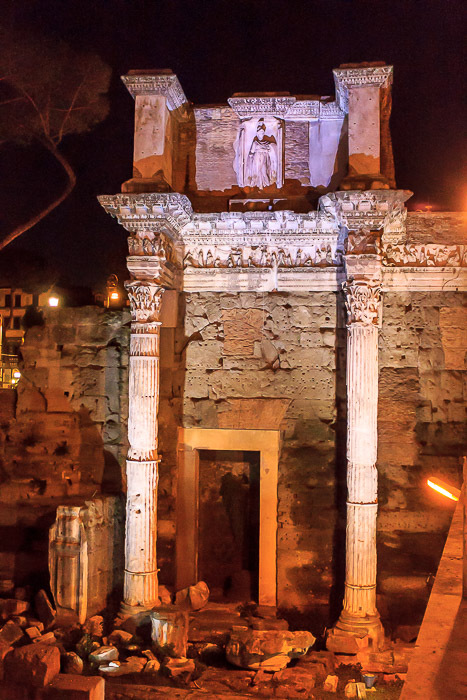 "I'll start at the Via dei Fori Imperiali entrance to the Roman Forum. Before you enter turn right and walk down the sidewalk along the main street over to between the second and third lamppost. 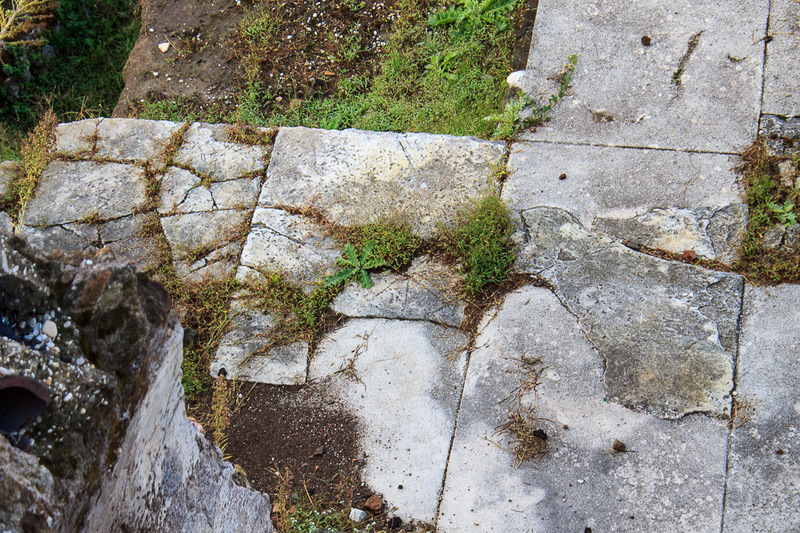 Walk over to the sidewalk railing and look down on a large section of large marble pavement slabs. 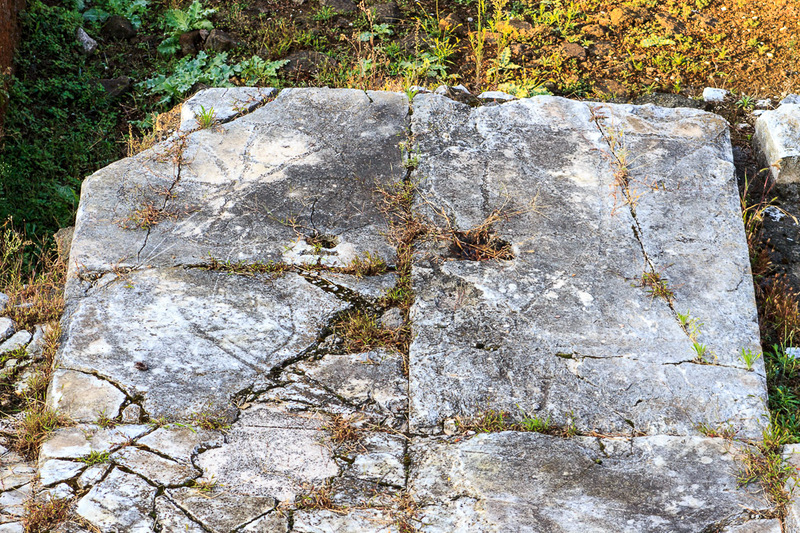 The distant two slabs have a rectangular game cut up into eighths on one and a circle game on the other with another faded circle game just below that one on the same slab. Now look to your left and the second slab from the far end also has a circle game on it." A Corinthian Capitol from this same area is shown in the 5th photo below. 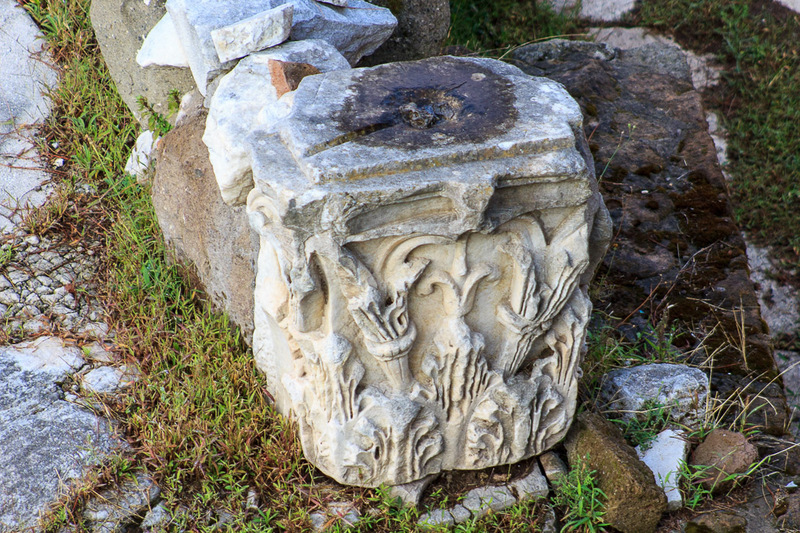 Circle game board in the Forum of Nerva on the south side of Via dei Fori Imperiali, between the second and third lamp post to the right of the entrance to the Roman Forum. One is at upper-left, another faint one is at upper-right. 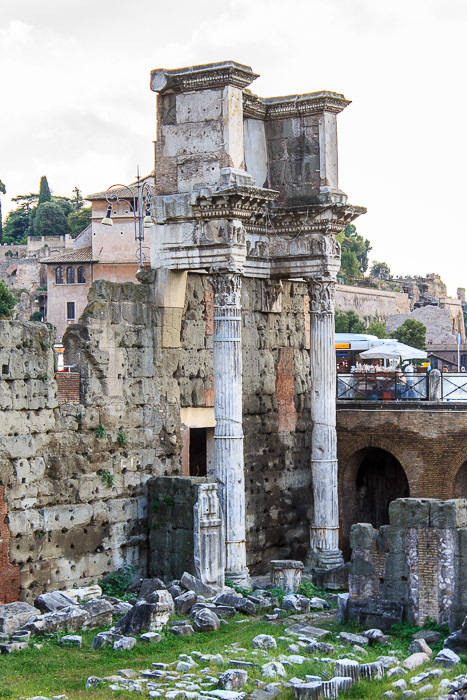 The Temple of Minerva was the centerpiece of the Forum of Nerva, but none of it remains today. It was located at the northern edge of the forum, against that back wall, and up against the curved exedra of the Forum of Augustus. 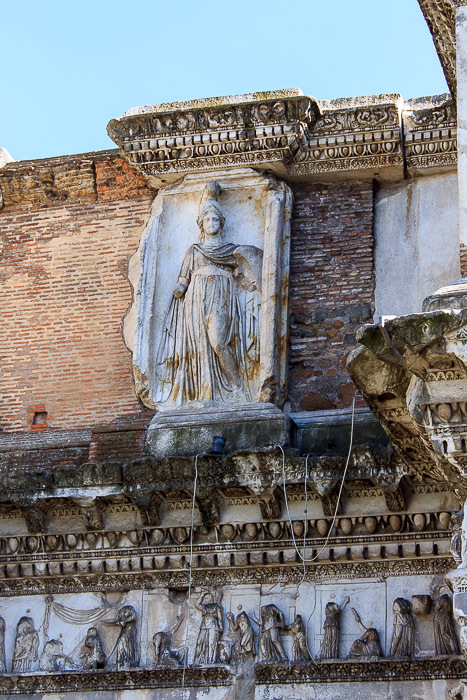 Domitian began construction of the forum in 85 AD, and it was him who built the Temple of Minerva because he was especially devoted to her cult. 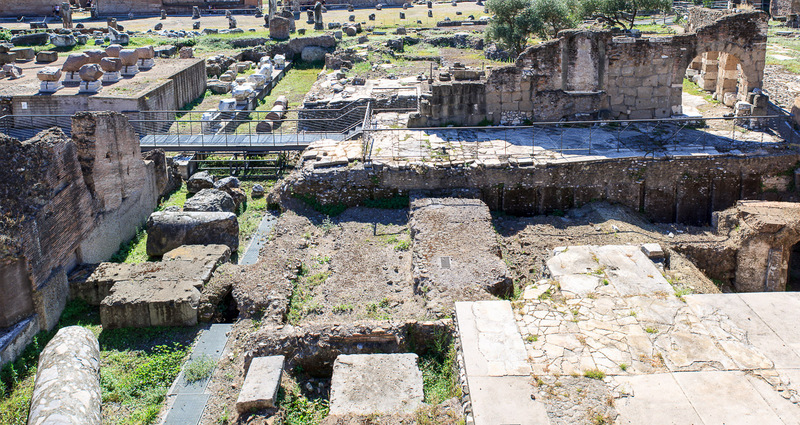 After Domitian's assassination, Nerva finished building the forum and dedicated it to himself in 97 AD. 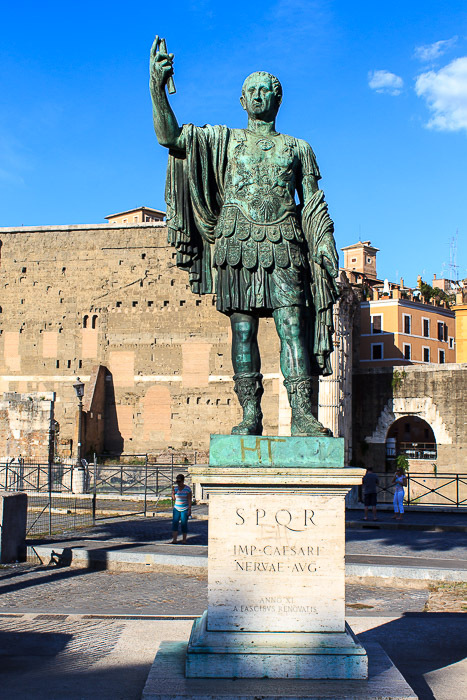 Since he was living and Domitian was dead, he took over the naming rights to the forum, and it is his statue that stands in front of the forum, along Via dei Fori Imperiali (1st photo below). 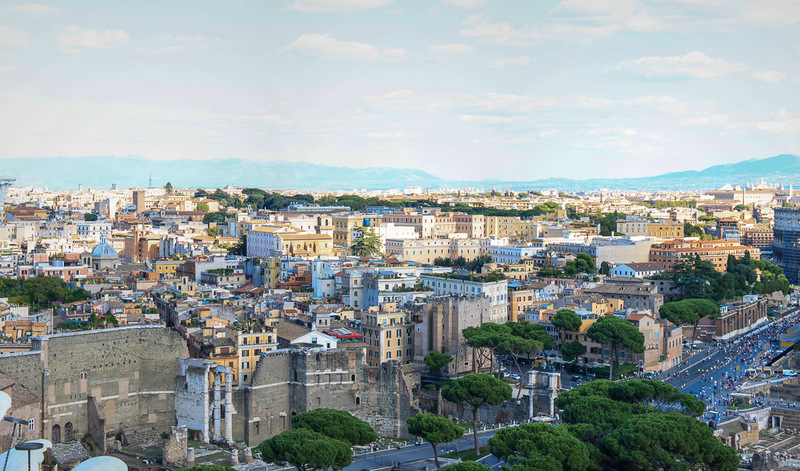 A considerable part of the Temple of Minerva was still standing in the 16th century, but Pope Paul V demolished it in 1606 to provide materials for the Big Fountain on the Janiculum Hill and the Borghese chapel in Santa Maria Maggiore. 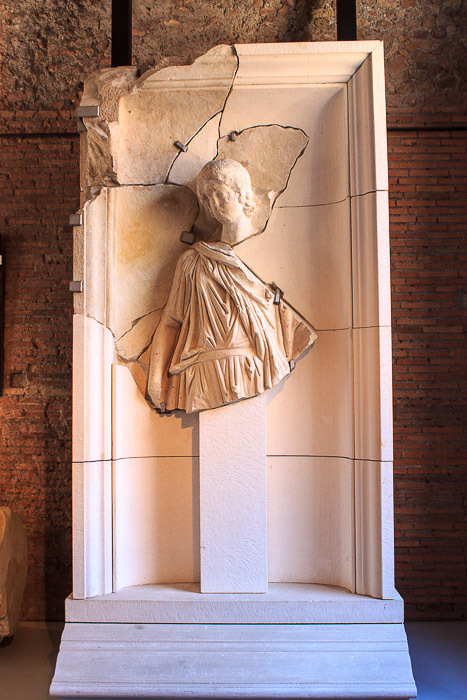 A few relics from the Forum of Nerva are on display in the Museum of Imperial Fora (2nd photo below). After the collapse of the Roman Empire, a number of houses were built on the site with materials salvaged from the ruins. 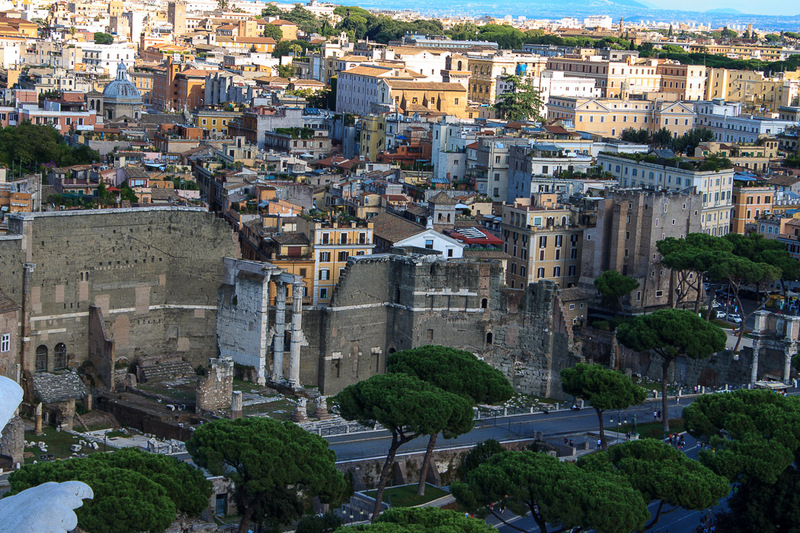 If you find the time to get to the top of the Victor Emmanuel Monument, you can see the Forum of Nerva (and the other Imperial Fora) as in the 3 photos below. 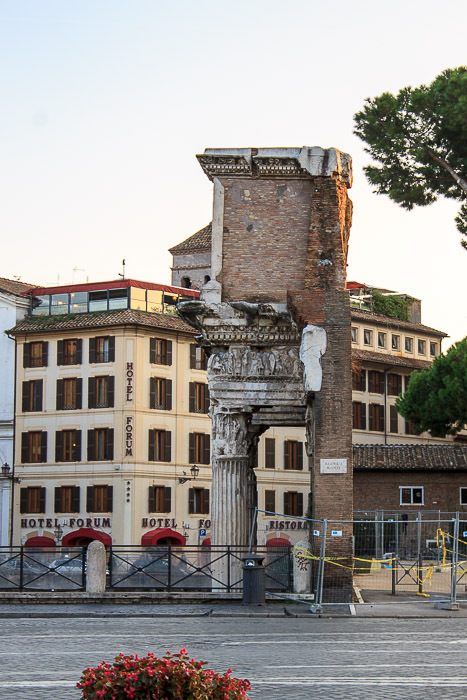 The Forum of Nerva is a tiny piece of those photos, but I'll bet you can find "those ugly columns" (Le Colonnacce) to find your way.